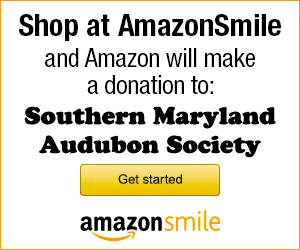 The mission of the Southern Maryland Audubon Society is “to promote appreciation, conservation, and protection of birds, other wildlife, and their natural habitats through education, research and outreach”. We would like to invite you to join us in the many ways we work to fulfill our mission. 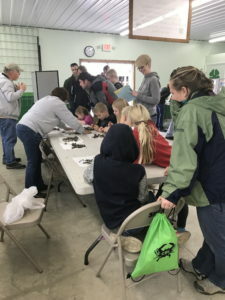 We have monthly meetings and field trips throughout most of the year, offer a variety of ways to become involved in the local birding community and produce an excellent newsletter we are proud to share with you. Please explore our website and then consider joining us for an adventure outdoors sometime. We’d love to have you. 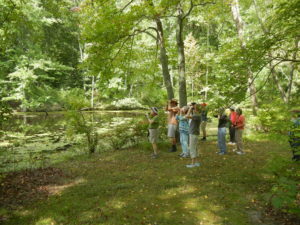 Birding in Southern Maryland is a 16 page brochure created by the Southern Maryland Audubon Society to help the birding community find local bird watching locations. It covers Calvert, Charles, St. Mary’s and southern Prince George’s counties. It is available here for download as a PDF file. You can print out a paper copy or save it to your smart phone or tablet to have handy for your next bird watching outing. After 251 submissions, and a vote on the final five, we now have names for our famous Charles County raptors. 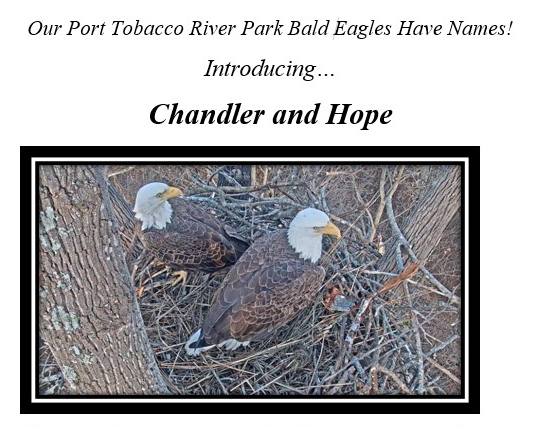 We are very happy that our bald eagles are named after the historic landmark Chandler’s Hope, which overlooks our nest. Charles County Parks department really made this fun, and more eggcitement is yet to come! 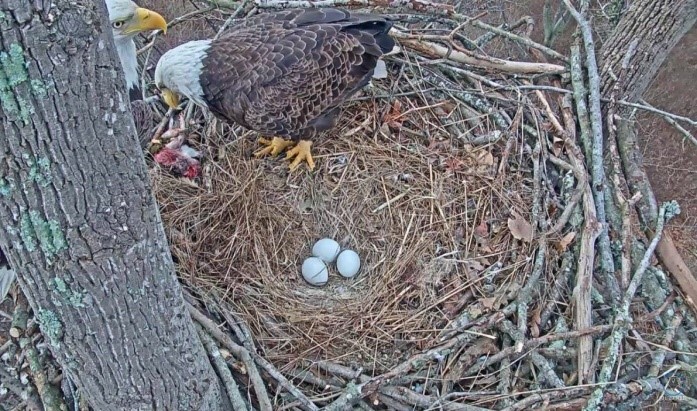 Please join in and watch the Port Tobacco River Park eagle nest cam at www.charlescountyparks.com. We have three eggs incubating and expect hatching of the first laid egg to take place on March 7, with subsequent hatchings on March 10 and March 13. 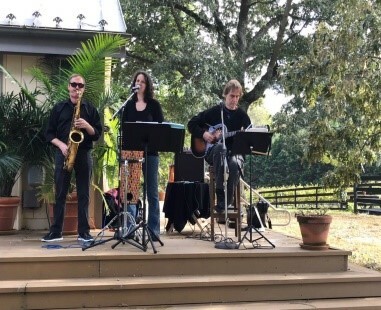 Earth, Wine, & Fire, our October 20th fundraiser, was a fabulous SMAS event! 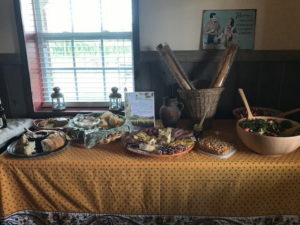 It began on a grey fall day with a lively group of nature enthusiasts gathered at Jefferson Patterson Park & Museum (JPPM). As we set out for a leisurely 2.5 mile private hike through open fields, wooded trails, and raised boardwalks above the marsh, the skies began to clear and birds began to sing. We were greeted by a flock of golden-crowned kinglets, warblers, and nuthatches foraging in the cedars! 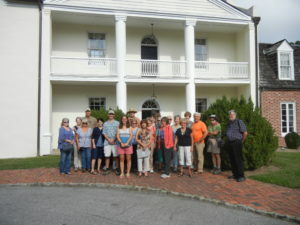 The tour, led by Julie with JPPM, explored various Native American, colonial, and post-colonial settlements including the Native American village and grounds of the Jefferson Patterson house. 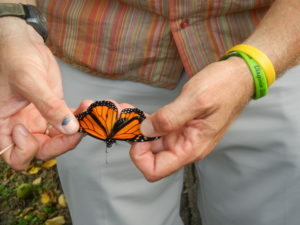 JPPM is a lovely venue to observe birds and other wildlife; a nature lovers dream. 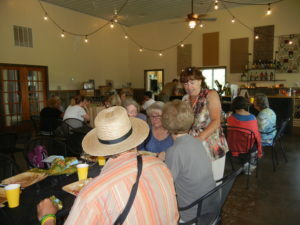 ineyards & Winery where we enjoyed a special wine tasting and dined on delicious French cuisine. 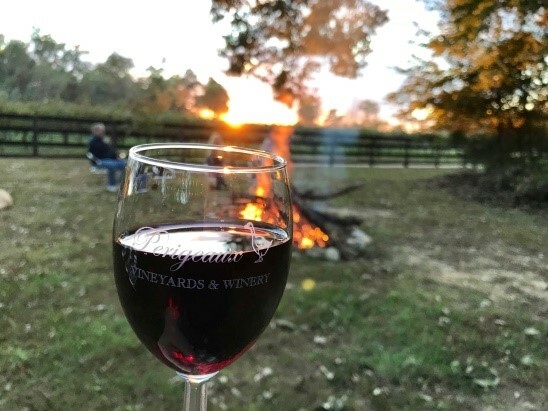 Perigeaux welcomes the nature around them and birds are often seen flitting through the grapevines. Deer, bats, owls, and even turkeys are known to visit as well. 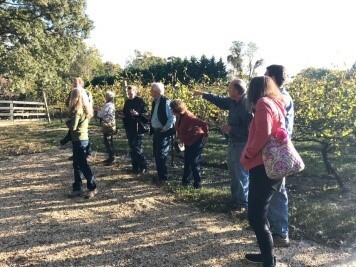 Perigeaux’s winemaker and co-owner, John Behun, treated us to a tour through the vineyard and winery. 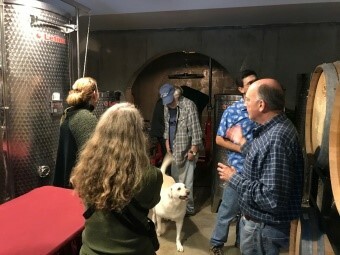 He patiently answered our many questions; we learned a lot about winemaking from growing the grapes, harvesting, and producing wine. 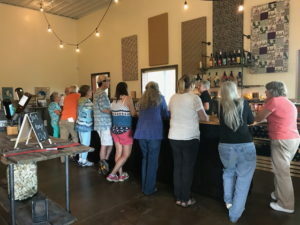 After the tour, we returned to the tasting room to enjoy (more) wine and live music. 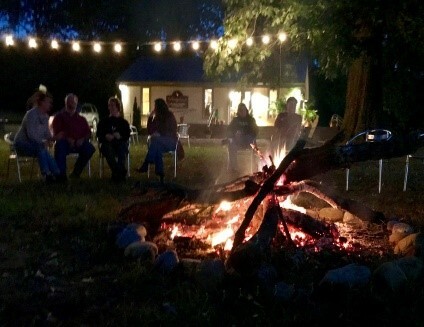 We gathered around the bonfire and watched the sun set over the Patuxent River; what a beautiful ending to a wonderful day! 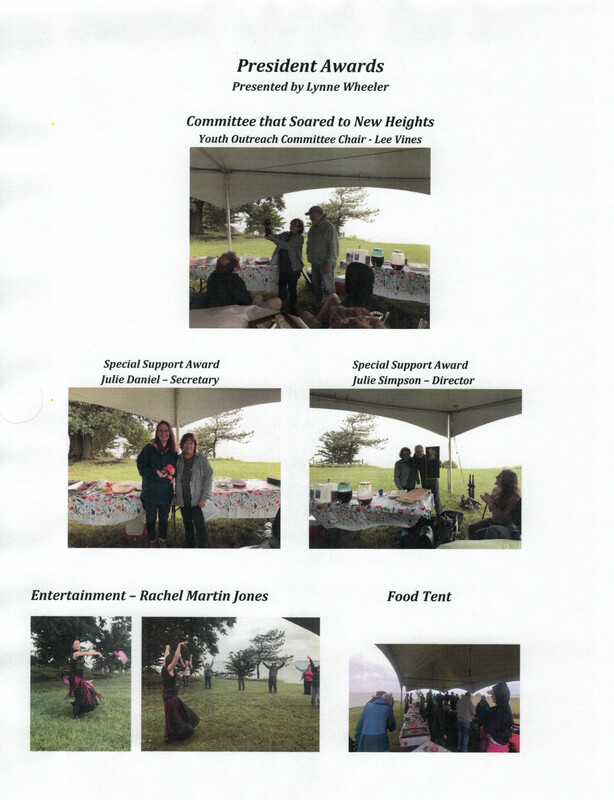 Last spring our society created a new committee, Youth Outreach, chaired by our Board of Director Lee Vines. 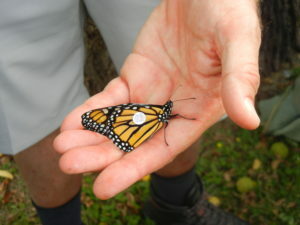 Lee, a retired biology teacher from the College of Southern Maryland, decided to steer his committee toward sharing his love of teaching, science, and nature to home-schooled children in our area. I have been fortunate to help Lee in his interest and passion. 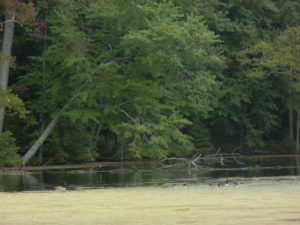 His committee’s strategic plan focused this year on offering nature classes. 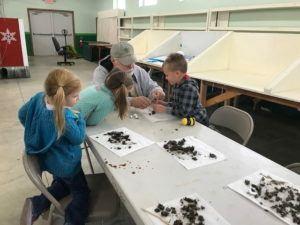 Five different topics have been chosen, several of them drawing on the National Audubon Society’s Audubon Adventure Environmental Education curriculum. 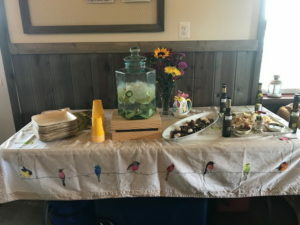 This April we held two classes – Give a Hoot about Owls on April 20thand Birds on the Move, April 27th. Boy, did we have fun with very remarkable groups! 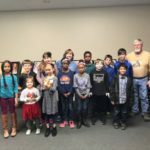 We advertised our first two classes via an internet group for local home schoolers, and through a contact for a Christian home school group. We ended up with a large waiting list for both classes! We shortly realized that we likely had a great idea and helped fill a void. 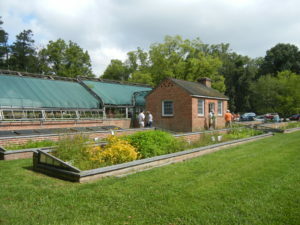 Both classes were offered at a wonderful venue, Thomas Stone National Historic Site, in Port Tobacco, MD. They have a lovely visitor’s center and were excited to partner with SMAS. They could not have been more accommodating! 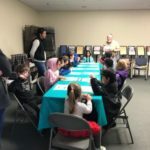 Fourteen students attended our Give a Hoot about Owls class. We gave a presentation about the owls of North America, with a focus on the owls of Southern Maryland. To a PowerPoint show we added eight videos, which all the kids said made the lecture a lot more fun and interesting. After the 45 – minute presentation we then had more fun (probably the most fun for them! ), dissecting owl pellets. Offered to children in 1stthrough 6thgrades, the class ultimately taught children ranging in age from 7 to 14, some of them traveling from as far away as Baltimore and Largo, MD. These kids were very engaged. We received some remarkable emails from students and moms about how much they enjoyed the class and that they look forward to joining us for more events. 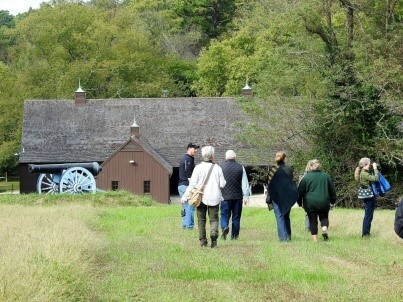 The second class, on April 27thalso met at Thomas Stone National Historic Site. This was a more advanced class on bird migration – titled Birds on the Move. We pitched it to students in 3rdthrough 8thgrade. 16 students, ranging in age from 7 to 12, traveled to the class from Largo and Lexington Park. 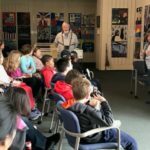 The 45 – minute lecture shared a lot of information about birds, flyways, how birds navigate, and the threats and challenges that migrating birds face. That PowerPoint presentation, too, had some fun videos. We ended the lesson with Birding 101 pointers, including how to use a field guide and binoculars. We then set out on a one – hour bird walk. Such lucky new birders! They got fantastic views of a Great Crested Flycatcher, Chipping Sparrows, Blue Grosbeak, Eastern Bluebirds, and Yellow-rumped Wabler, to name a few. We also heard the Ovenbird; one very smart student remarked, after seeing a picture of an Ovenbird, that it reminded him of a Wood Thrush! They also got a very long look at and heard the song of an accommodating male Summer Tanager, which prompted a discussion of sexual dimorphism too! Total species count was 23. These two classes were thoroughly enjoyable for us and the students. In late summer and early fall, we will offer three more classes – The Buzz about Native Bees, Plants Are for the Birds!, and finally, Lee’s great passion, Nature Journaling. 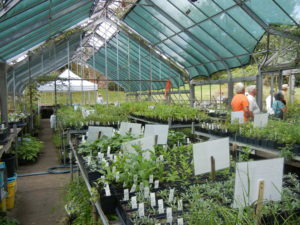 This opportunity would not have been possible without a donation from a local foundation. We received funds for new binoculars, field guides, Cornell Laboratory of Ornithology Birding 101 folding pocket guides, blank nature journals, and Audubon Adventure educational materials. Huge thanks! You know who you are! Much love…. On Saturday, November 4, SMAS participated as a vendor at the St. Mary’s County Fairgrounds for the third annual St. Mary’s Public Schools STEM Festival & Expo. The festival kicked off October 31st and ended November 12, encompassing 535 events all throughout the state! 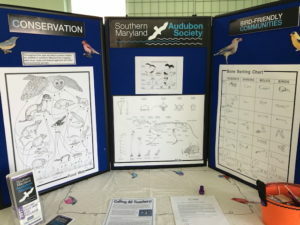 Our society had fun from 10 a.m. to 2 p.m. sharing information to students about the owls of southern Maryland, focusing on the food web as it pertained to owls and waterbirds of the Chesapeake Bay. The highlight for kids was the dissection of owl pellets. The kids swooped in on us, filling every space at our tables, diligently teasing away the animal hair to uncover the hidden treasures of bones. Thanks to our board members Julie and Will Daniel for their assistance and Lee Vines who I think could dissect and explain owl pellets in the dark. We all had great fun, and look forward to participating in this event next year!! On Saturday, October 28, SMAS participated in the open house for the Port Tobacco River Park, Tom Roland Natural Resource Area, in Port Tobacco. 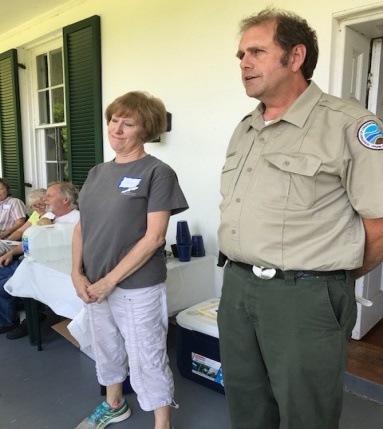 We were co-sponsors along with the Port Tobacco River Conservancy, U of MD Charles County Master Gardeners, and Charles County Tourism.We are so grateful to have this new park, in which preserving nature in its natural state is celebrated. The event from 9 a.m. to noon was a beautiful day. 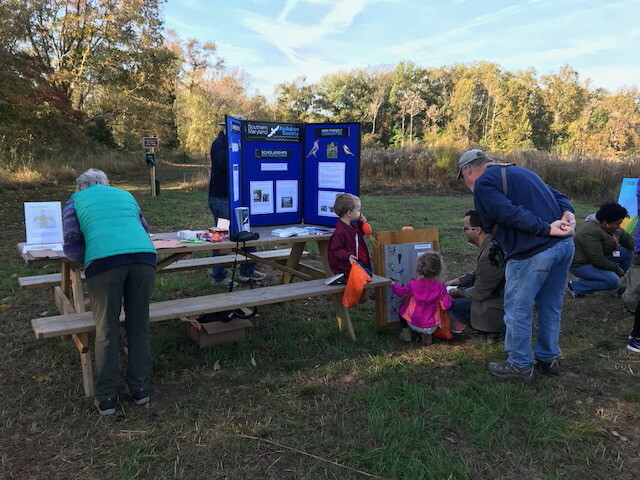 Our table featured an electronic bird identification board that young birders-to-be enjoyed, an eagle puppet craft, and a nature and bird walk. 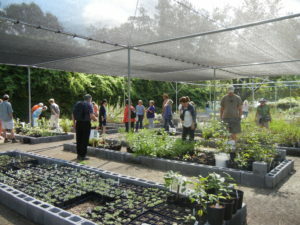 The SMAS-led walk had great attendance, almost 20 people, and truly was a pleasure for all. 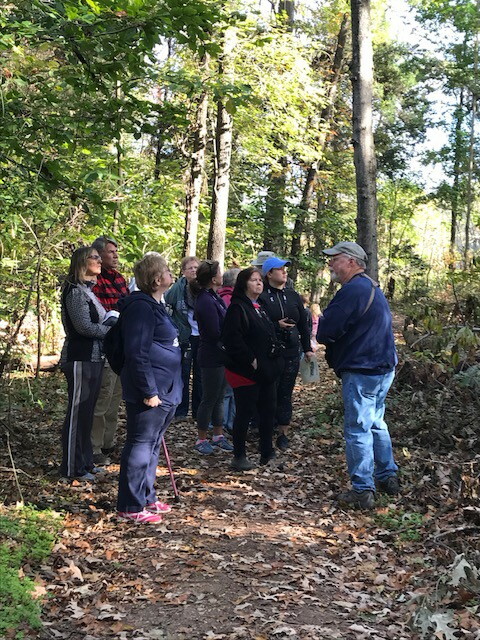 The park has four trails, for this open house walk we explored the Eagle Trail, Wetlands Trail and a portion of the Butterfly Trail. While I focused on the avian species, our Youth Outreach committee chair Lee Vines shared his extensive knowledge of flora in the park. It is always so funny to have Lee explain the difference in the identification of grape vines vs poison ivy with such an appropriate moniker. My favorite memory was playing the sound of the Eastern Towhee and getting a return song response and view. It was the look on their faces which made it so rewarding. We also had fun with about a dozen Swamp Sparrows and many seemed to enjoy learning the sound difference vs. the Song Sparrow. While the great weather is now leaving us, this park will be the gift that keeps on giving this winter season. A local Eagle Scout, Ted Hoxie, has installed multiple Wood Duck boxes along the riparian buffer we can monitor, the trails along the river will give us great views of waterfowl, and we have an active Eagle nest! 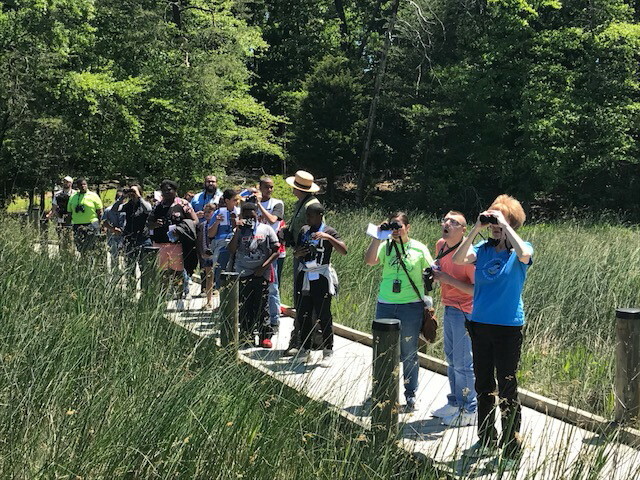 We are excited to host upcoming educational events to view the nest, and to participate in the Eagle Nest Monitoring program organized by the Maryland Bird Conservation Partnership with youth groups. Thank you Charles County for such a gem of a park! We appreciate greatly this gift and will cherish and respect it through the years. 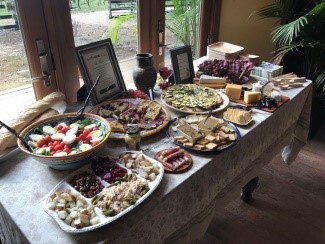 On Sunday, June 4th we hosted our Annual Meeting and Picnic at the fabulous Mount Aventine at Chapman State Park, Charles County. 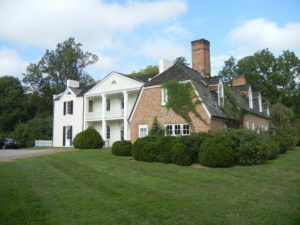 This historic 1840 manor overlooking the Potomac River is breathtaking, and the weather was perfect. Being one of our Important Bird Areas made it an ideal choice. The 2254 acre site on the shores of the Potomac River offers miles of trails and an unusual array of coastal plain habitats. 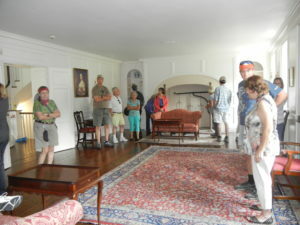 The manor house is supported by the not for profit volunteer organization Friends of Chapman State Park who offer many programs throughout the year. This manor house and lush property are a must for all to see and enjoy! 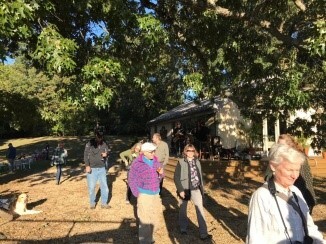 Many members brought delicious side dishes and contributed toward the fried chicken, all of which we enjoyed while sitting outside on the front porch. The river view, the breeze, and the company made the meal especially satisfying. Thereafter we held our annual elections of officers (no change) and directors. Welcome aboard Tim Wells, our new director! Every year SMAS presents a Conservationist of the Year Award. 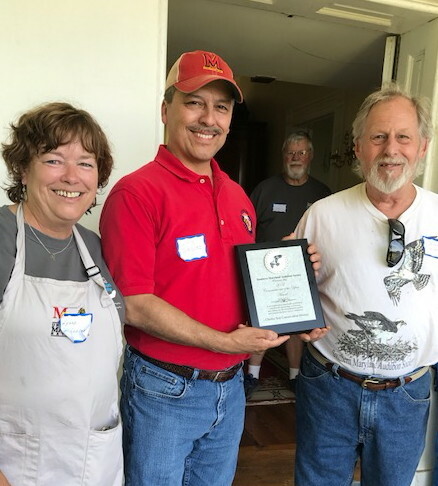 This year we were happy to present it to the Charles Soil Conservation District. 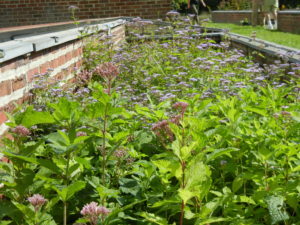 Their stellar environmental work made them an obvious and much deserving choice. 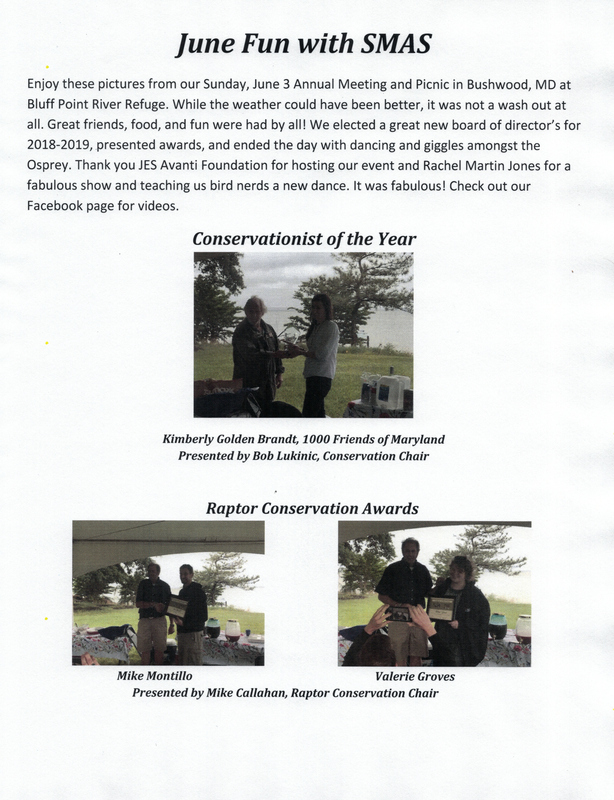 The SMAS board of directors also presented a special award this year to our Raptor Conservation Committee. 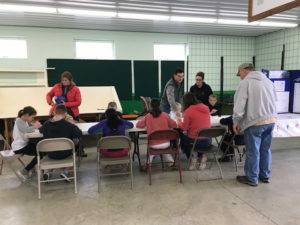 The committee soared to new heights with multiple Barn Owl banding events that generated 300% over projected income. We applauded the chair, Mike Callahan, and our Adopt-a-Raptor chair, Carole Schnitzler, for their hard work and effort. Mike received an Audubon Barn Owl print; Carole was given a silver Barn Owl necklace. SMAS is happy to share with southern Marylanders our exciting new adventure, Green Time for kids with ADD/ADHD or Autism Spectrum Disorder. 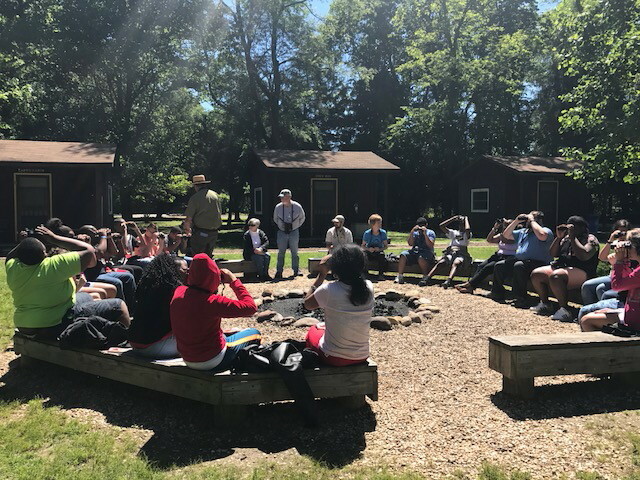 On May 15 our newly formed Youth Outreach committee, chaired by Board of Director Lee Vines, held its first bird and nature walk for twenty 6th to 8th grade students from Benjamin Stoddert Middle School. Research shows that time spent in nature can help improve academic performance, reduce stress, and provide physical benefits. 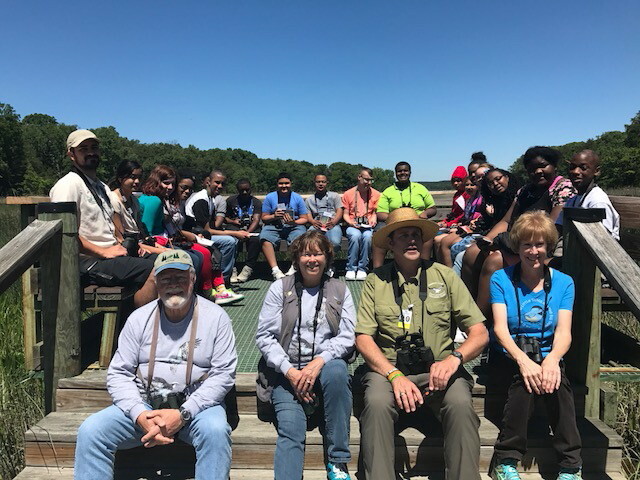 With the help of Nanjemoy Creek Environmental Education Center, instructors Mike Callahan and Joshua Boyd, SMAS board members Carole Schnitzler, Lee Vines, and Lynne Wheeler, we enjoyed two hours sharing nature with children that deserve all we can give. We plan to hold more events. If interested in having your child take a nature walk with SMAS contact Lee Vines at 301-752-4976 or Leevines3@gmail.com. Stay updated, join MD-SMAS today!